The first commercial cigarettes were made in 1865 by Washington Duke on his 300-acre farm in Raleigh, North Carolina. His hand-rolled cigarettes were sold to soldiers at the end of the Civil War. It was not until James Bonsack invented the cigarette-making machine in 1881 that cigarette smoking became widespread. In 1836, New Englander Samuel Green stated that tobacco is an insecticide, a poison, and can kill a man. In 1847, the famous Phillip Morris is established, selling hand rolled Turkish cigarettes. Soon after in 1849, J.E. Liggett and Brother is established in St. Louis, Mo. 1000 BC People start using the leaves of the tobacco plant for smoking and chewing. How and why tobacco was first used in the Americas no one knows. The first users are thought to have been the Mayan civilizations of Central America. Cigarette smoking is the number one risk factor for lung cancer; it's responsible for 87 percent of lung cancer deaths. Your chance of still being alive five years after being diagnosed is less than 1 in 5. COPD (chronic obstructive pulmonary disease) is an obstructive lung disease that makes it hard to breathe. Cigarettes contain anywhere from 8 mg of nicotine up to 20 mg of nicotine. Most cigarettes are at the lower end of the spectrum, which puts the average amount of nicotine in one cigarette at 12 mg. While the total amount of nicotine in a cigarette may vary, the amount that you actually absorb is relatively constant. Adrenaline is then released, increasing heart rate and blood pressure, and making breathing rapid and shallow. As nicotine use continues, these effects can damage your heart, arteries, and lungs, increasing the risk for heart attack, stroke, and chronic lung disease. Cigarettes and other forms of tobacco, including cigars, pipe tobacco, snuff, and chewing tobacco contain the addictive drug nicotine. Nicotine is readily absorbed into the bloodstream when a tobacco product is chewed, inhaled, or smoked. Nicotine is the primary component of tobacco, and is the primary reason that tobacco is addictive. 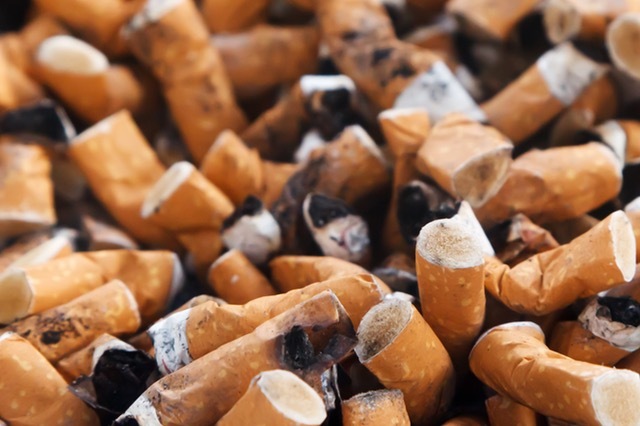 In 1988, the Surgeon General concluded that cigarettes and other forms of tobacco, such as cigars, pipe tobacco and chewing tobacco, are addictive and that nicotine is the drug in tobacco that causes addiction. Nicotine provides an almost immediate “kick” because it causes a discharge of epinephrine from the adrenal cortex. This stimulates the central nervous system and endocrine glands, which causes a sudden release of glucose. Stimulation is then followed by depression and fatigue, leading the user to seek more nicotine. Nearly 90 percent of adult smokers began smoking before age 18 and 14 percent of high school seniors reported smoking in the last month. Nearly 23 percent of high school students use tobacco products, and more than 90 percent of those teens smoke cigarettes, cigars, hookahs or pipes, according to the report from the U.S. Centers for Disease Control and Prevention. Teens smoke for many reasons and often for the same reasons as adults do: to cope with stress, to control their weight, as a social habit and to combat boredom. One of the biggest reasons teens start to smoke is peer influence: their friends do it. Studies show that this is especially true for girls. 90% of the above 440,000 is 396,000 teen smokers. 396,000 smokers who started as teens die each year from smoking related diseases. Each day 6,000 children under the age of 18 start smoking. Washington, DC remains the state with the lowest percentage of smokers (12.2%), a distinction it has held since Gallup and Heathway’s began tracking smoking habits in 2008. Kentucky (30.2%) and West Virginia (29.9%) have the highest smoking rates in the nation, as has been the case since 2008. Most people start smoking when they are in their teens and are addicted by the time they reach adulthood. Some have tried to quit but have returned to cigarettes because smoking is such a strong addiction. It is a habit that is very difficult to break. There are many different reasons why people smoke.